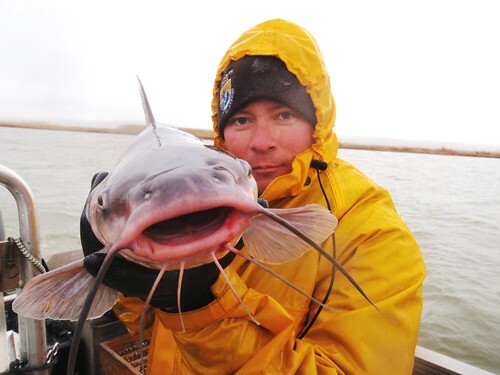 Great Plains FWCO biologist Dan James and a channel catfish caught during standardized gill net surveys on the Missouri River downstream of Fort Randall Dam. Numerous fish species are declining in the Missouri River and its tributaries. In addition to pallid sturgeon, 9 native Missouri River species have been targeted since monitoring began on this project in 2003 (i.e. surrogate species): shovelnose sturgeon, blue sucker, sauger, sand shiner, sicklefin chub, sturgeon chub, shoal chub, western silvery minnow, and plains minnow. The decline in Missouri River fish species is being attributed to habitat modifications and flow changes resulting from the construction and operations of the mainstem Missouri River dams. Standardized fisheries assessments are providing key information used to evaluate current habitat restoration efforts and guide future projects.